Roasted okra with lemon zest, cajun spices, kale, grilled haricot vert, and roasted garlic. It's topped with white miso sauce and dusted porcini mushrooms. The Pickle Me (left): six-grain rice with gobo, carrot pickled daikon, avocado, topped with carrot ginger sauce. The Spicy Mang (left): black rice, avocado, mango, English cucumber, spicy vegetables. It's topped with toasted cayenne. Vanilla Chia Seed Pudding: with cinnamon roasted apples and caramel sauce. 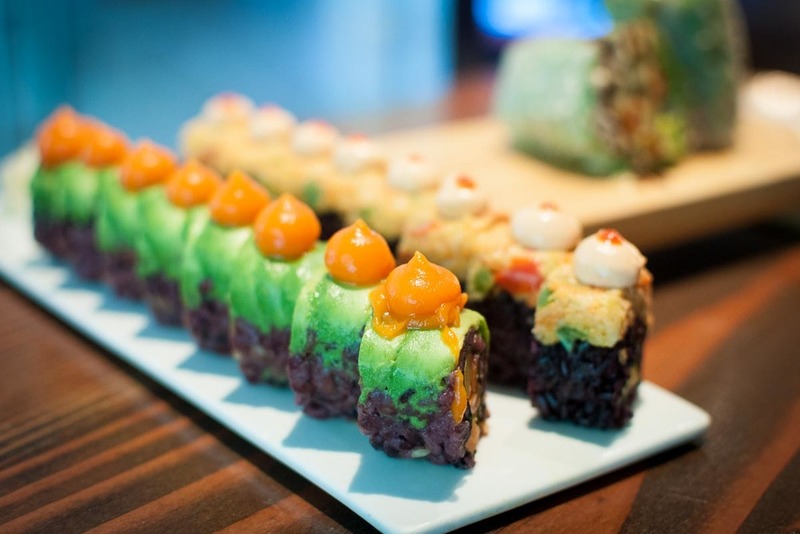 Chef Guy Vaknin wants you to give his vegetarian sushi a try. He says leave out the protein and opt for fruits and vegetables. Here he breaks down how he makes his rolls and passes along the NYC restaurants he recommends for vegetarian cuisine. You can try his vegan rolls yourself at his two NYC locations. The idea is that we are serving healthy food that is fun. The sushi style rolls are the best way to get the flavor combinations in one bite. I think that the hardest thing for chefs is that there has to be a meat or fish on a plate. Every protein gets flavored with spices, but you can do the same thing with vegetables. If cook a piece of chicken in water, it has no flavor. If you cook a carrot in water, it has flavor. When I pick the grains, I pick them for texture. 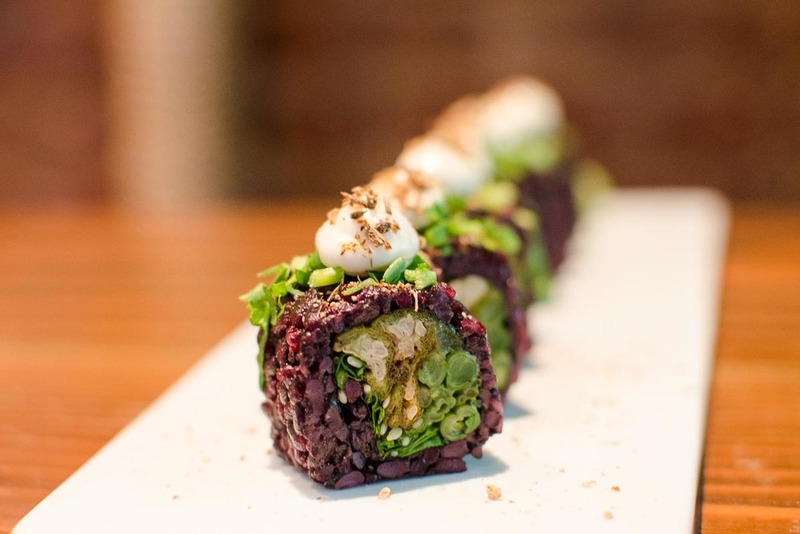 The barley and rye berries give the rolls texture since we also use smooth vegetables like sweet potato and avocado. We try to maximize and balance the flavor of the vegetables and grains. We do one roll each month that is seasonal, local, and organic and we source all the ingredients from Union Square Greenmarket. For the rolls, we use avocado and grape seed oil, certain fats that are good for you. I also use lot of herbs to enhance the flavors, like thyme, rosemary, parsley, cilantro, and tarragon, but you have to be careful that it is not overpowering. I use a lot of spices from dried peppers like chipotle, guajillo, chile, and Cajun spices. I like using intense flavors, but in the right amounts. Dried, shaved porcini mushroom on the roll is very strong, but it goes really well in support of the other ingredients. You need to pair the right flavors in the roll. Even the sauces, the mango chili is straight mango with chili. The chili enhances the sweetness of the mango. The ginger and carrot go together. The carrot mellows it out with a little vinegar. It is very high end. They have a nine course vegetarian menu and the food is really, really good. It's an out of this world experience. What they can do with vegetables, it just shows you what is possible. This is one of my favorite vegetarian restaurants. It is high-end vegetarian chef Amanda Cohen puts a lot of effort and pride into her dishes. The experience is very intimate because there is an open, small kitchen and you see the chef, which is a great sign. Her dishes are innovative, interesting and intricate and the menu changes seasonally. Make a reservation ahead of time. There are a few of them in the city. Candle 79 is more higher-end and the other two are more casual. They serve really great vegetarian food. This is one of the best trucks in the city (they also have a brick-and-mortar place). They do vegan Asian-Fusion and they make good sandwiches. They also make great desserts. I love their creme brulee donut. They have great falafel. This is the type of food I grew up on. 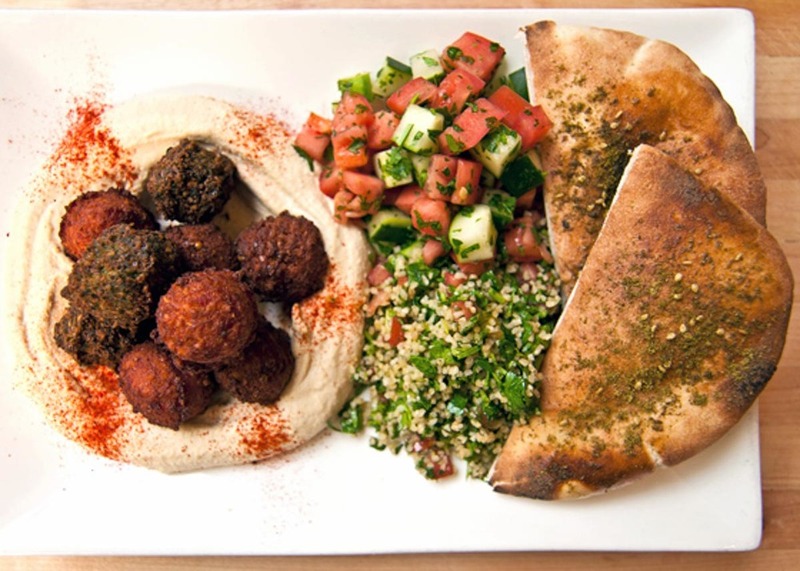 This is a Moroccan restaurant, but the owners are Israeli and the food is very similar to what you get in Israel. Their couscous is great. My parents are from Morocco and they serve the type of food I grew up on.